Wisteria House in Henstead, near Southwold, Suffolk sleeps 6 people. Wisteria House near Southwold is a semi-detached property, lovingly renovated to a very good standard, which is located in the village of Henstead (a designated Area of Outstanding Natural Beauty), just outside Southwold. Blending a stunning mix of traditional features with luxurious touches throughout. The property offers a large, open plan kitchen/dining room with French doors overlooking the rear garden and giving access to the patio. 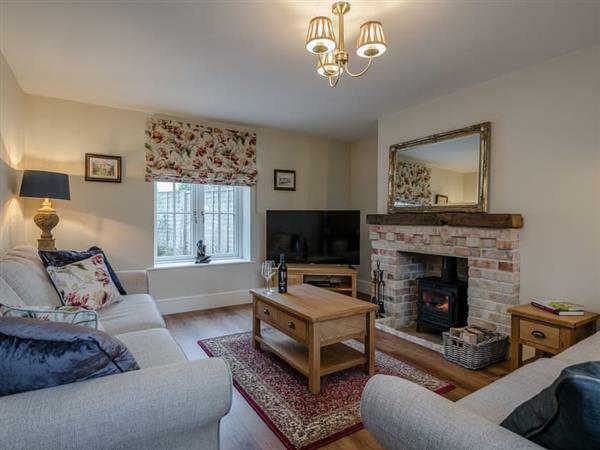 The cosy living room has a traditional wood burner, perfect for a wintry getaway. Upstairs guests can enjoy a spacious master bedroom, and a large family bathroom with a double sink and double shower. The second bedroom has a double bed with en-suite shower room. The third bedroom has twin beds. Wisteria House is ideally located to explore the Suffolk Heritage Coast, and Southwold is a short drive away along with Aldeburgh, Beccles and RSPB Minsmere. There are two pubs in the nearby village of Wrentham, where you can also find a convenience store and places to eat. Nearby Beccles, a thriving market town, is a short drive inland, where you can also access the Norfolk Broads National Park. The nearest beach (Benacre) is just over 3 miles away with the popular beach of Southwold being 7 miles away. Located in the village is an ’Arts and Crafts Centre’ where you can find a café and a selection of artists and emporiums. There is a beach 3 miles from Wisteria House near Southwold. With the nearest shop and pub 2½ miles, and the restaurant is 3 miles from Wisteria House. Living room: With wood burner, 50 Smart TV, DVD player with a selection of DVDs, books and games, wooden floor and French doors leading to patio. Kitchen/dining room: Farmhouse style with breakfast area, electric oven, gas hob, microwave, fridge/freezer, dishwasher, washing machine and wooden floor. Bedroom 2: With zip and link super king-size bed (can be twin beds on request) and Freeview TV. Bedroom 3: With zip and link twin beds (can be double on request). LPG underfloor heating, gas, electricity, bed linen, towels, Wi-Fi and logs for wood burner included. Travel cot, highchair and stairgate available on request. Welcome pack. Small enclosed garden with patio, garden furniture and barbecue. Private parking for 3 cars. No smoking. Holidays at Wisteria House run from Friday to Friday. For a better idea of where Wisteria House is, you can see Wisteria House on the map below. Wisteria House is in Suffolk; should you be on the lookout for a special offer, you can find all the special offers in Suffolk. It's always worth checking to see what is on offer at the moment. Do you want to holiday near Wisteria House (UK10387), you can see other cottages within 25 miles of Wisteria House; have a look to find your perfect holiday location.